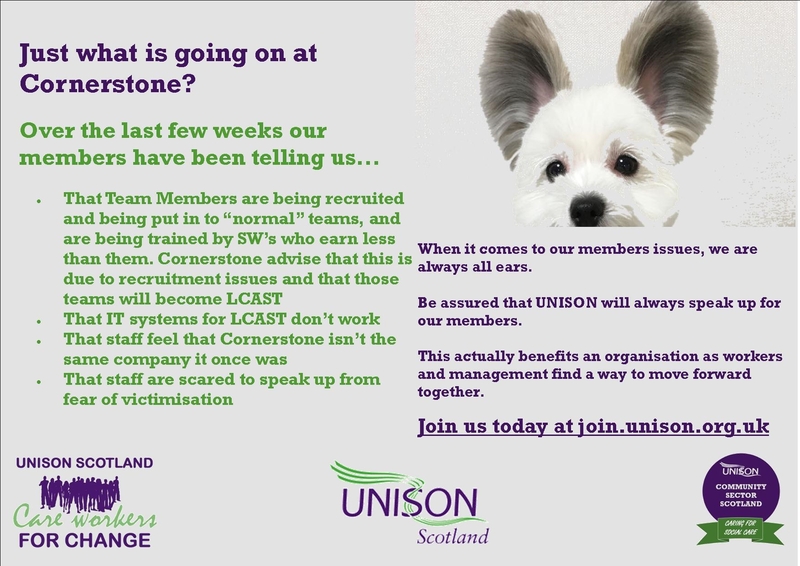 As you will know, your UNISON Cornerstone Stewards are frustrated at how negotiations have been handled by the Cornerstone leadership team over the last few months, culminating in the recent pay offer which we have recommended that members reject. UNISON stewards have been trying to arrange a formal JNC (Joint Negotiating Committee) with Cornerstone to discuss outstanding issues from the agenda of the last meeting, and anything that has come to our attention since. Louise Dickson, Head of HR has advised us that there will not be a meeting until December 11th. This leaves members questions unanswered and stress levels increasing as staff concerns remain ignored. In recent months we have been speaking to members across the country and across job roles and they have been consistent in the things that they have been telling us. Members in Aberdeen tell us that Team Members are being recruited on the LCAST rate of pay and job description but are then put into existing teams, carrying out the work of a Support Worker (SW). It has also been put to us that the SW’s will be expected to train these new members of staff who are earning more than them. We have emailed HR to gain clarity and were advised that in Aberdeenshire, staff are being recruited on LCAST terms to address recruitment issues. This does not make sense to the staff side and we are seeking further clarification on behalf of colleagues affected. This concerns us greatly. If the IT systems aren’t working properly, and the work that should go through them is still being completed by existing Team Leaders, Managers, Admin etc …..doesn’t this mean that there aren’t any fully functioning LCAST teams? Where does this leave the whole project, and our members role in it? We have had numerous comments from members along these lines, see examples below. Members say that they used to feel valued, and that they knew that the service users were being put first by the charity. Many members no longer feel this way and fear what is coming next. Sadly, this was a consistent message from our latest round of members meetings, and in multiple conversations with members since. Again, this is being reported right across staff groups from Support Assistants to Service Managers. This appears to tie in with the comment above as we have not received comments like this, on such a regular basis, before. As Stewards we remain ready to discuss all of these issues, and more, with the Cornerstone leadership team as soon as possible. Our UNISON colleagues are experienced in raising complex issues with employers and then working with them to resolve the problems. This joint working benefits employers across the UK everyday as we speak and act with 1.4 million members. Closer to home, this benefits a number of large charities, and members who work for them, in Scotland. As always, we will keep you up to date as matters progress.